Delta Airlines says they are working with two deaf women who say an employee of the airline discriminated against them at Metro Airport. 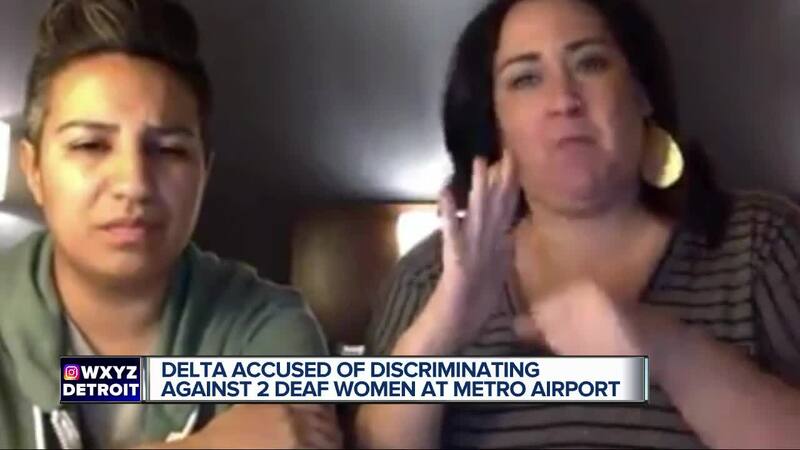 METRO AIRPORT (WXYZ) — Melissa Elmire Yingst and her partner Socorro Garcia claim in a video they posted on social media that they were discriminated against by Delta Airlines Sunday night at Metro Airport because they are deaf. Now they are spelling out what they want to get it resolved. The two say they asked to have their seats together on a flight from Detroit to Los Angeles and they had issues communicating with the gate agent because they are both deaf. They say they were writing on paper when the agent threw away the paper. They say when Socorro went to get the paper and she was bumped. The agent apparently called police because a customer was going behind the counter. A cell phone video shows an agent and a voice is heard, "do you want to call the police" and the answer is yes. The women were escorted out and spent the night in a hotel and then posted their video signing their complaint on camera. They flew to Los Angeles the next day on a different airline. They spell out their version of events in a lengthy statement issued today and say this can be resolved if Delta reimburses them for their expenses and trains its employees to deal with deaf customers. Delta is in contact with two customers who reported having difficulty communicating with a gate agent prior to their flight. We are reviewing the situation with our Detroit team and will work with these customers to better understand what transpired. As always, we take situations like these seriously and we are using this as an opportunity to learn and improve.